Planning a trip involves lots of searching for flights, hotels, things to do, itineraries and more. The process is often cumbersome because we have to use multiple tools to gather everything we need—especially on a mobile phone. We’re evolving the way our hotel search works on smartphones to help users explore options and make decisions on their smallest screens. 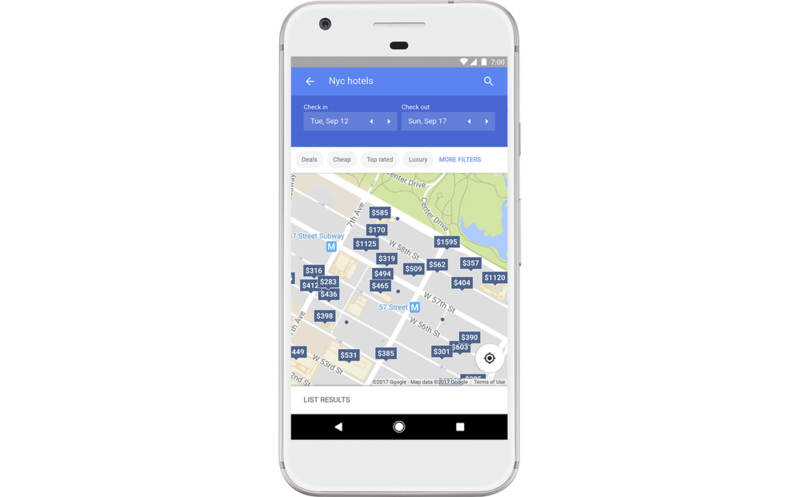 The new hotel search experience includes better price filtering, easier-to-find amenity information and the ability to book right from Google. We’re also rolling out new features in some countries on mobile search to make it easier than ever to check out your travel options when you’re on the go. In the next few days, you’ll see that if you search for a flight in Google Flights, you can click right in to “Hotels” at the top of the page. This lets you easily click over to check hotel availability and prices in your destination city for the dates you’ve already selected. And it works the same way if you start by searching for a hotel. You can easily click to the “Flights” tab to check prices and fare options, and easily book your flight when you’re ready. The same options appear if you want to learn about a specific place, or when searching for things to do there. Let’s say you’re checking out a trip to Sydney. You can now easily click to browse available hotels or flights while you’re exploring the destination. Clicking on “More Destinations” in the top left will drop you into a new experience that lets you explore other destinations, weekend getaways and trips you might be interested in. We’ve also included a feature called Your Trips that helps you see, at a glance, all your upcoming and past travel reservations from Gmail. These results are private, and only you can see this information. You can email your trip reservations to friends or family right from Your Trips, and also make edits and access them directly offline with the Google Trips app (Android, iOS) when you’re traveling. This year we’re focused on making your mobile phone an integral and useful part of your travel planning—and enjoyment! This entry was posted in Google Travel Blog and tagged Google Flights, Google Travel, travel on February 6, 2018 by Eric Zimmerman. The end of the year is fast approaching, but the fun doesn’t have to end after the ball drops in Times Square. When you’re ready to kick off your travel plans for 2018 and take a weekend getaway, check out our trending destinations for travel inspiration, and our new features to feel confident you’re getting a good deal. Long weekends are a great excuse to escape to warmer weather, but worrying about getting the best price for your vacation can be stressful. A recent study we did indicated that travelers are most concerned about finding the best price for their vacations – more than with any other discretionary purchase. Google Flights can help you get out of town, even when you're on a budget. Using machine learning and statistical analysis of historical flights data, Flights displays tips under your search results, and you can scroll through them to figure out when it’s best to book flights. Say you were searching for flights to Honolulu, and flights from your destination were cheaper than usual. A tip would say that “prices are less than normal” and by how much to indicate you’d spotted a deal. Or, if prices tend to remain steady for the date and place you’re searching for, a tip would indicate the price “won’t drop further” based on our price prediction algorithms. Similarly, when you search for a hotel on Google, a new tip will appear above results when room rates are higher than usual, or if the area is busier than usual due to a holiday, music festival, or even a business conference. So if you're planning a trip to San Francisco or Las Vegas, you can make sure you're avoiding dates when big conferences are scheduled and hotel prices tend to be high. If you prefer to wait and see if prices drop, you can now get email price alerts by opting into Hotel Price Tracking on your phone—this will roll out on desktop in the new year. Vacation time is precious, and once you book your flight and hotel and arrive at your destination, it’s time to have some fun. 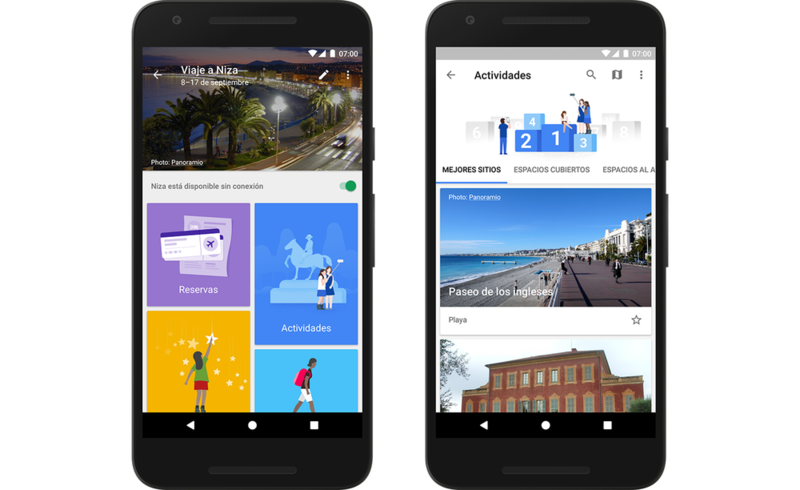 Google Trips’ new Discounts feature helps you instantly access deals for ticketing and tours on top attractions and activities. Book and save on a tour of the Mayan ruins near Cancun, or get priority access to the top of the Eiffel Tower in Paris. No matter where you’re headed (and if you need ideas, read on), Trips makes it easy to browse and access fun stuff to do on your vacation without breaking the bank. 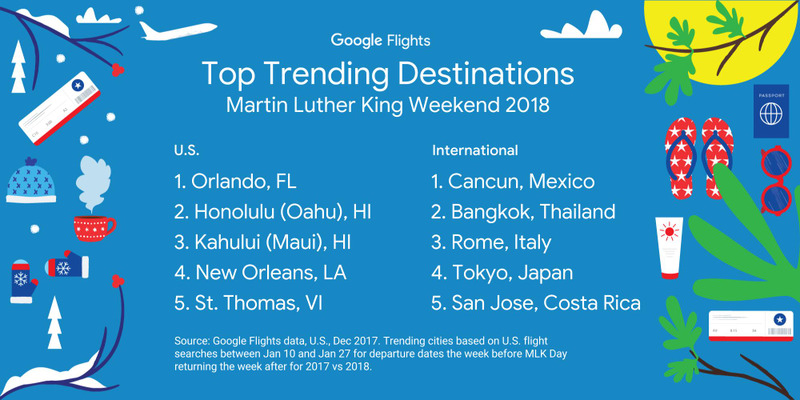 People are already searching for flights for Martin Luther King Jr. weekend, from January 12th to 15th. The top trending domestic destinations for MLK Weekend offer a warm climate—with Florida and Hawaii taking the lead. For folks heading out of the country, Cancun and Bangkok are top beach destinations, whereas Rome and Tokyo are top cultural destinations. Presidents’ weekend is right on the heels of Valentine’s Day next year, so it’s easy to take time off to spend time with that special someone, celebrate singledom with friends, or maybe just treat yourself to a solo adventure. 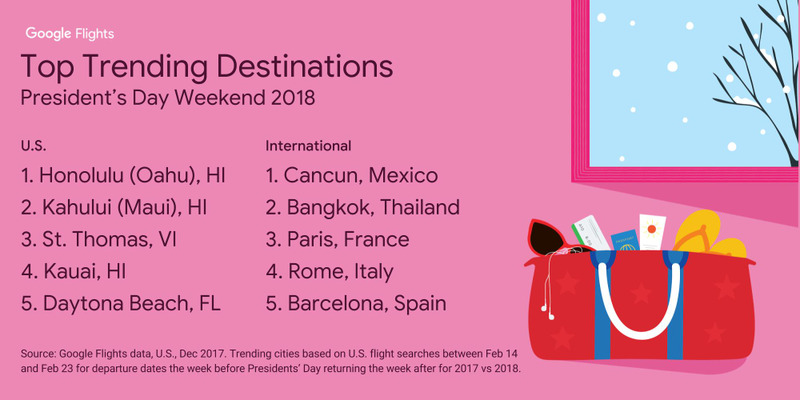 Tropical islands are the most popular for a domestic getaway, with three of Hawaii’s major islands—Oahu, Maui, and Kauai—all trending in flight searches. 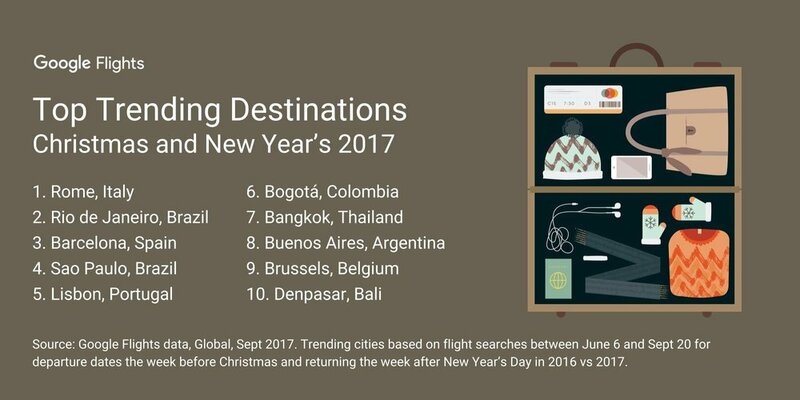 For international flight searches, Cancun and Bangkok still top the list, but classic European cities like Paris, Rome, and Barcelona are also climbing in popularity. Amidst celebrations with friends and family this December, start dreaming about your next winter getaway in the new year. We’ll help you get there. This entry was posted in Google Travel Blog and tagged Google Flights, Google Travel, travel on December 14, 2017 by Richard Holden. Millions of Americans will fly somewhere for Thanksgiving this year—and for many of them the search for flights will begin this week. 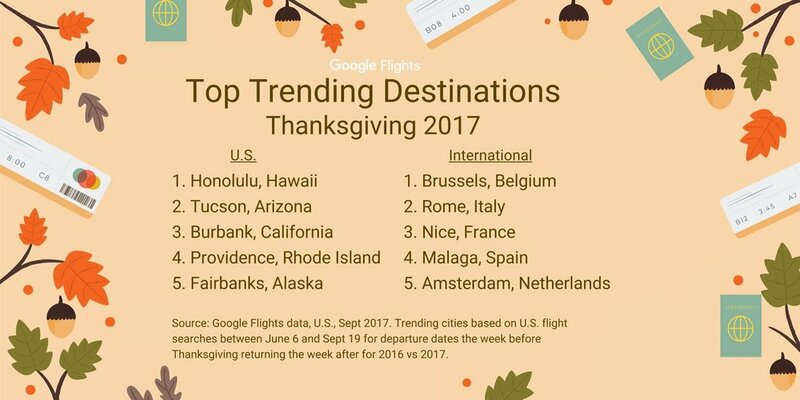 Last year we saw a spike in Google Flights searches for Thanksgiving dates starting in mid-October. 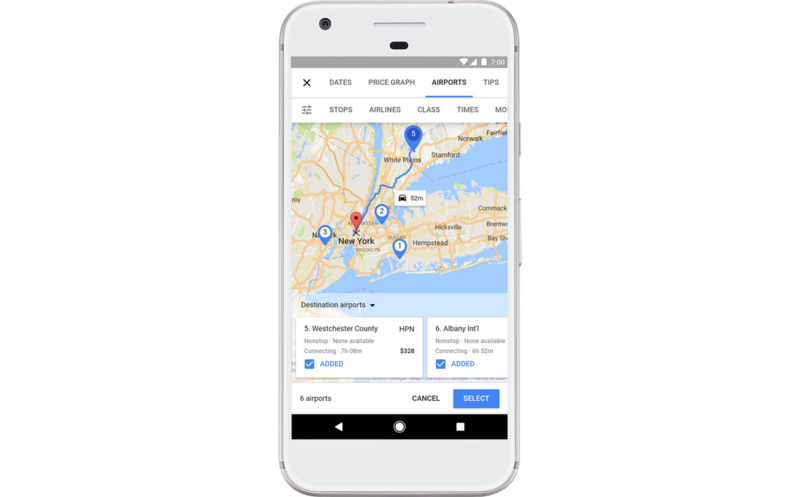 So whether you’re flying to visit family or heading off on vacation, here are a few tips from Google Flights to help with your holiday travel planning this year. 1. Avoid the busiest travel days. The last thing you need during the holidays is the added headache of long lines at the airport, flight delays or cancellations. Americans are pretty predictable when it comes to Thanksgiving travel plans—flight searches over the last two years indicate that Friday Nov. 17, Wednesday Nov. 22 and Sunday Nov. 26 will be the busiest days to fly, so pick other travel days if possible. If it’s an option to consider alternate airports, Google Flights can help you identify other more affordable options that are close to your destination. Just tap on “airports” in the flight insights bar and move the map icon to see the closest airport to your final destination. 3. Get away instead of going home for turkey. While many people choose to go home for the holidays, it’s also an ideal time to get away from it all. Whether you prefer the warm beaches of Hawaii, or you’re interested in exploring a new European city like Brussels, Destinations on Google has travel guides on most popular destinations to help you figure out what to do. Search on Google for any of the trending destinations below to see travel guides complete with top sights, popular itineraries, weather, videos, and more. 4. Book your flights before expected price increases. Flight prices often rise 21, 14 and 7 days in advance of travel dates. For example, if you’re looking at a departure date of November 23, you can expect significant increases in flight prices on Nov. 1, Nov. 8 and again on Nov. 15. 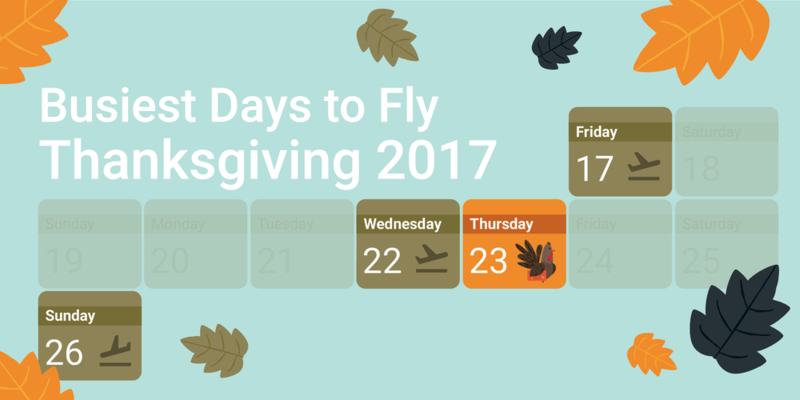 So make sure to book your Thanksgiving flights by the end of October to get a better deal. And while it may still seem far off, it’s time to start thinking about the end-of-year holidays like Hanukkah, Christmas and New Year’s Eve. In fact, at this time last year end-of-year flight searches were already increasing worldwide. In order to avoid hefty increases in airfare you should book your flights for these holidays before December. If you’re not ready to book yet, keep track of flight prices with Google Flights and receive email updates when prices change. Whether you’re flying home to see family or going on a well deserved vacation, the holidays should be a time to relax and enjoy time with the people you love. Avoid the stress of last minute holiday travel planning—follow these tips from Google Flights, sit back and look forward to the festivities ahead! This entry was posted in Google Travel Blog and tagged Google Flights, Google Travel, travel on October 10, 2017 by Matt Kayala. For all you travelers and explorers out there, planning your next vacation just got easier. Google Trips, Google Flights, and Destinations on Google now support a combined 20 new languages and 26 new countries globally. So whether you’re just starting to get ideas for your next trip, or you're ready to book your flight and get to sightseeing—we’ve got you covered. 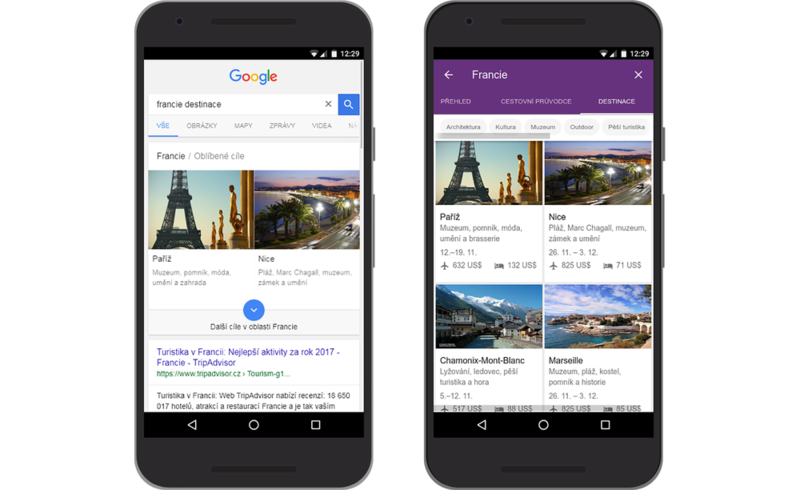 If you need some suggestions for the place you’re dreaming of going next—maybe you’ve heard great things about Provence in southern France and want to know more—Destinations on Google can help. Simply search for “Provence destinations” on Google, and we’ll show you a collection of popular destinations to choose from in the region like Nice, Marseilles and Avignon. Tap on each city and instantly see top sights, popular itineraries, local weather, high seasons for travel and more. Hint: this rich collection of travel information from Destinations is at your fingertips when you search for any of the top destinations in the world with “destinations,” and now available in 14 new European and Asian languages. The new languages include Bulgarian, Croatian, Czech, Filipino, Hungarian, Indonesian, Japanese, Lithuanian, Malaysian, Romanian, Russian, Serbian, Slovakian, Slovenian. 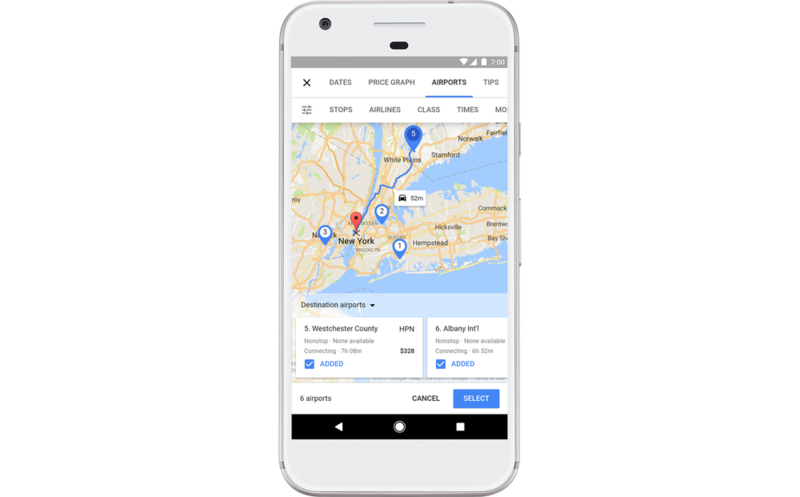 When you’re ready to book your travel, Google Flights makes it easy to find the best flights, compare your options, and book with whatever airline you choose. 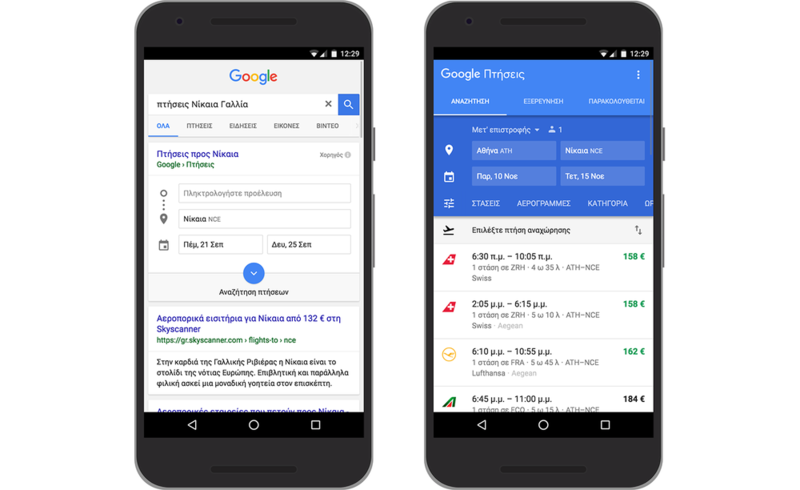 Now search on Google for flights in 26 additional countries in Europe by searching for things like “Flights to Nice, France” or “Flights to the U.S.” Or you can go directly to Google Flights to find results. The full list of new countries includes Albania, Armenia, Azerbaijan, Belarus, Bosnia and Herzegovina, Bulgaria, Croatia, Cyprus, Czechia, Estonia, Finland, Georgia, Greece, Greenland, Hungary, Iceland, Latvia, Lithuania, Macedonia, Moldova, Montenegro, Romania, Serbia, Slovenia, Slovakia, and Ukraine. Finally, when you’re on your vacation and ready to fill your day with sights and activities, instantly discover cool things to do nearby with Google Trips. If you end up in Nice, we’ll show you highlights like the Colline du Chateau for great views or stops for art lovers like the Musee Matisse. Get all your travel reservations, suggestions for things to do, and customizable day plans at your fingertips and available offline. The mobile app is now available on Android and iOS in six new languages globally, including French, German, Italian, Portuguese, Spanish, and Japanese. Vacation is a time to recharge or have some adventure, and planning your next getaway shouldn’t be a lot of work. We’ll keep working to help make each step of the way—from the wanderlust phase to arriving in Nice—as stress-free as possible no matter where you’re traveling from. This entry was posted in Google Travel Blog and tagged Google Flights, Google Travel, travel on September 6, 2017 by Eric Zimmerman. Everyone loves a good deal—especially when it comes to travel. That’s why last year we added tips on how to save money to Google Flights and hotel search on Google. Being flexible on travel dates and where to stay helps save money when planning a trip—so now we’re adding more ways to explore dates, airports and hotel locations to help you save when you have a bit of wiggle room in your itinerary. In order to make flight prices—and potential savings—easier to find for a wide range of dates, we’ve added more price insights to Google Flights. Tap on “Dates” to see the calendar view of date combinations with the cheapest prices highlighted in green and the most expensive in red. Or if you have a certain length of trip in mind, the price graph allows you to see how airfare varies over time. Just swipe left to see more dates. These new flight insights are now available on mobile and will be rolling out to Google Flights on desktop later this year. We’ve also added new features to help you find the cheapest dates to reserve a hotel. When choosing dates for a specific hotel, you’ll now see the nightly rate in the calendar view. Or you can check out price trends for a hotel to see how rates change over time. Now you can see all nearby airports on an interactive map, view the distance between each one and your final destination, and select the most convenient airports to include in your results. 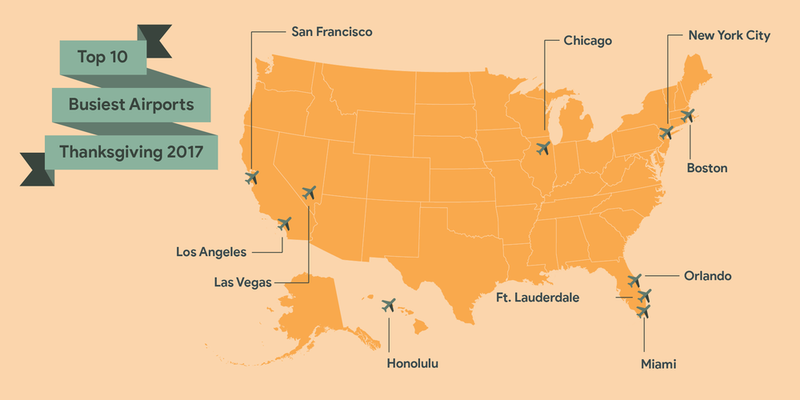 This shows you all your airport options, offers more flights to choose from, and might save you a few dollars, too. When you’re trying to choose a hotel, you can now see hotel prices on a map to quickly identify the best areas and hotels for both your budget and itinerary needs. You may find that a hotel just around the corner from a museum you’re interested in is available at a great price. When it comes to travel planning, flexibility pays off. Search for flights and hotels on Google to save time and money planning your next trip, so you can focus on the journey ahead. 1 Google Surveys n= 467 U.S. people 18+ who planned a vacation in the last year, July 2017. 2Google Flights data, Global, July 2017. 3Google Flights data, Global, July 2017. This entry was posted in Google Travel Blog and tagged Google Flights, Google Travel, travel on August 29, 2017 by Nabil Naghdy. 1Google Surveys n= 467 U.S. people 18+ who planned a vacation in the last year, July 2017. This entry was posted in Google Travel Blog and tagged Google Flights, Google Travel, travel on August 29, 2017 by Sunil Tewari. 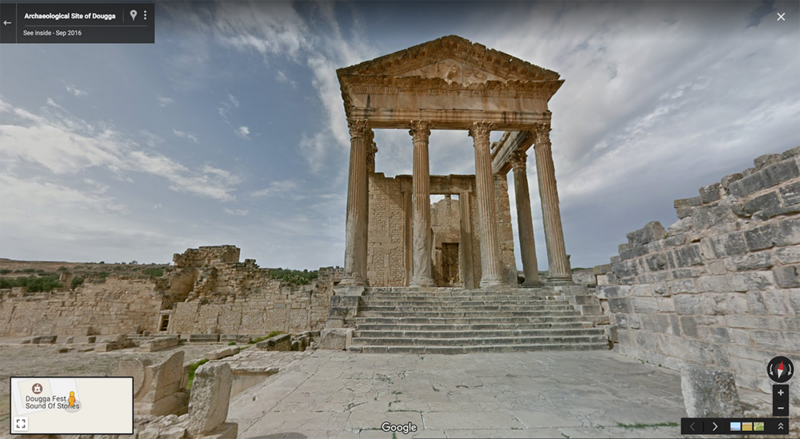 My Street View journey took me to Tunisia, home to beautiful sun soaked beaches, ancient Roman ruins, and Islamic monuments. 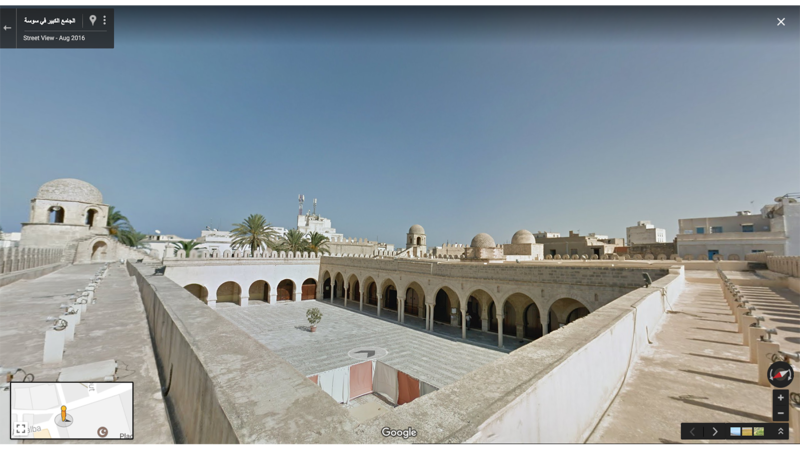 And now you can explore Tunisia on Street View too. The first stop is the Amphitheatre of El Djem, the largest Roman amphitheatre in North Africa, located in the heart of Tunisia. This beautiful monument stands in the midst of a lively and vibrant town—El Djem—previously known as “Thysdrus,” a prosperous town during the reign of the Roman Empire. 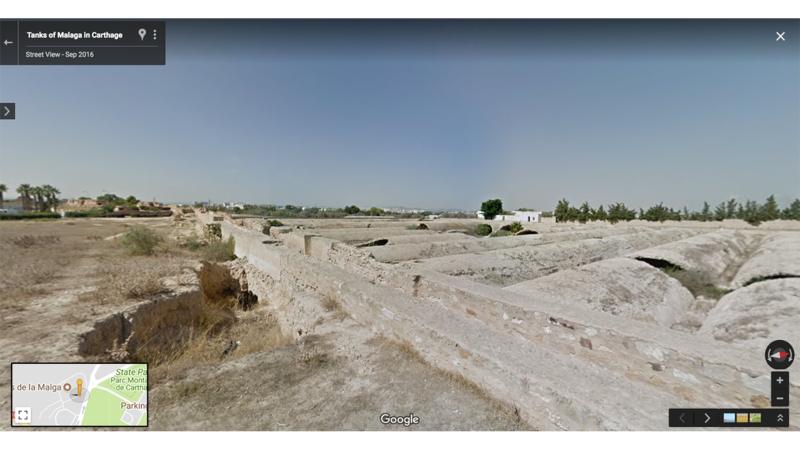 Then I went on to explore the massive city of Carthage, founded in the 9th Century B.C. and home to an iconic civilization. It is also the hometown of the famed warrior and military leader, Hannibal, who grew to lead victorious battles. Today, Tunisians regard Carthage and the memory of Hannibal with a strong sense of pride. 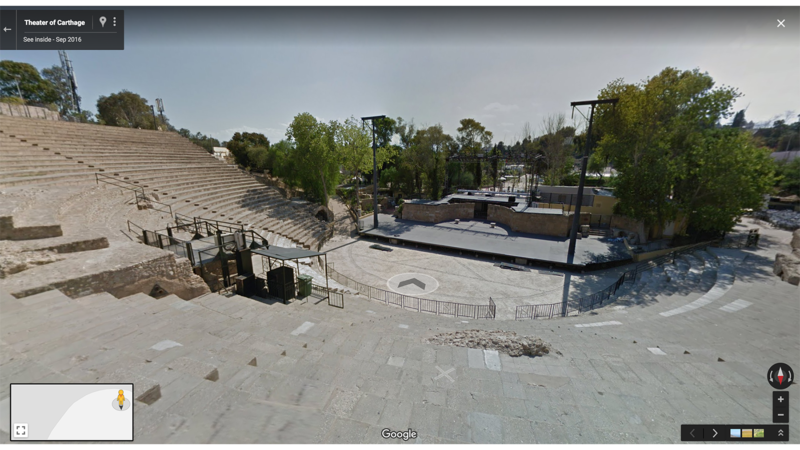 Use Street View to take a stroll through the Theatre of Carthage, Cisterns of La Malaga, Basilica of Damus al-Karita and the Baths of Antoninus which face the stunning view of the Mediterranean. The Cisterns of La Malga provided the water supply for Carthage—especially the Baths of Antonius—during the Roman Empire. 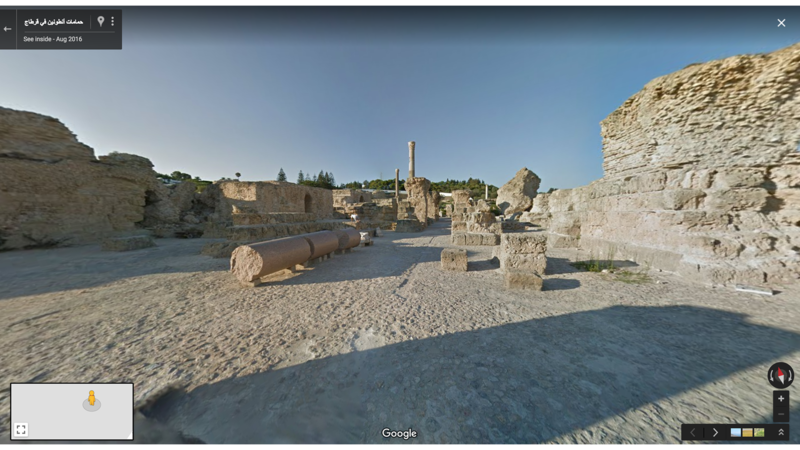 Located in Carthage and overlooking the Mediterranean, the Baths of Antoninus are the largest set of Roman Thermae built on the African continent dating back to the Roman Empire era. Built in the mid-second century, the Theatre of Carthage could contain 10,000 spectators. Now it is where Carthage’s major international and musical festivals are held. 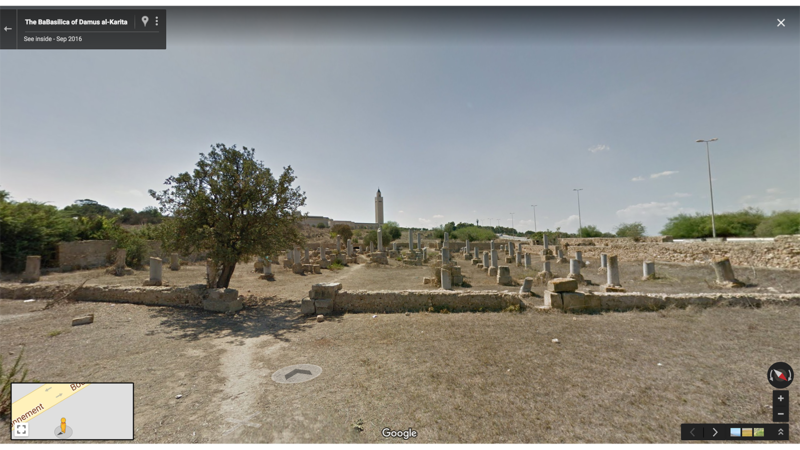 The Basilica of Damus al-Karita, within the archaeological site of Carthage, was a cemetery church dating back to the Byzantine times. 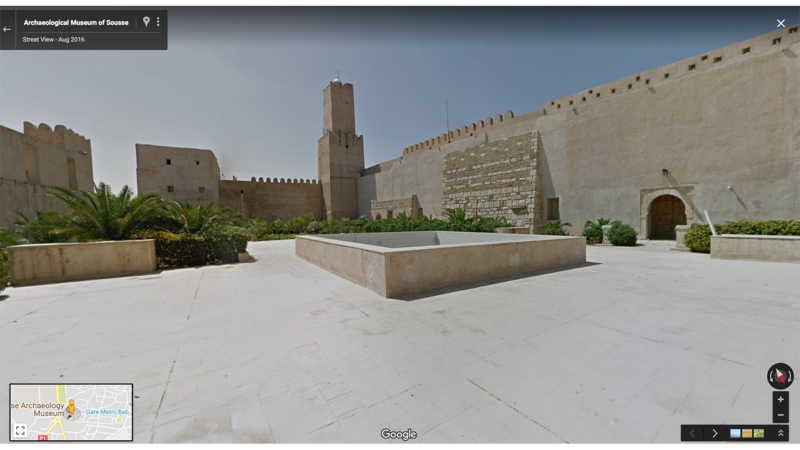 The Ribat of Sousse is a soaring structure that was used as a minaret and a watch tower. It is one of the best conserved fortresses built along the North African coastline as a defence against assailants. According to a Kufic inscription in the Great Mosque’s courtyard, the stunning structure was built in AD 851 during the time of Aghlabid dynasty. 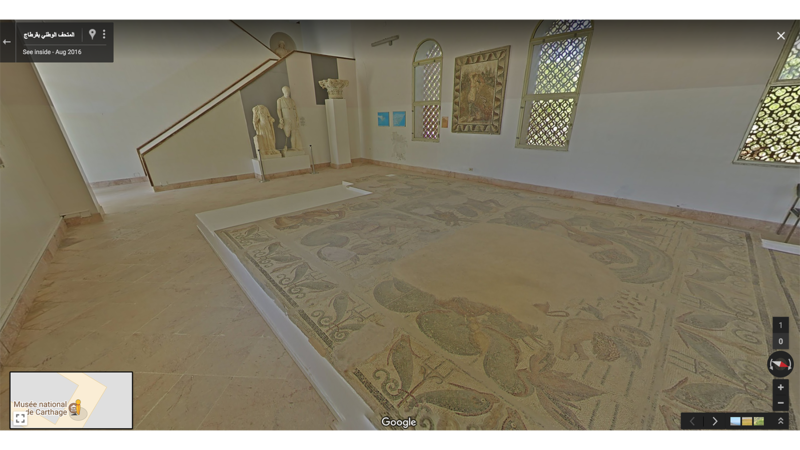 The Archaeological Museum of Sousse was established in 1951 and contains the second largest collection of mosaics in the world after that of the Bardo National Museum in Tunis. Originally, The National Bardo Museum was a 15th Century Hafsid Palace. 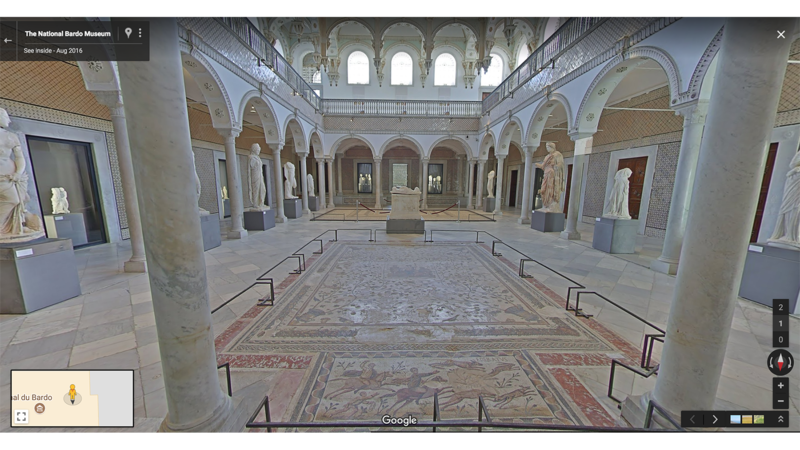 Now, it is the second largest Museum in Africa tracing the history of Tunisia over several millennia. Enjoy the three sections of the archaeological museum of Sbeitla: the Capsian culture, the Dionysus empire, and the Mosaic Exhibition. Utique Museum was built in 1990 and is located in the Utique archaeological site. 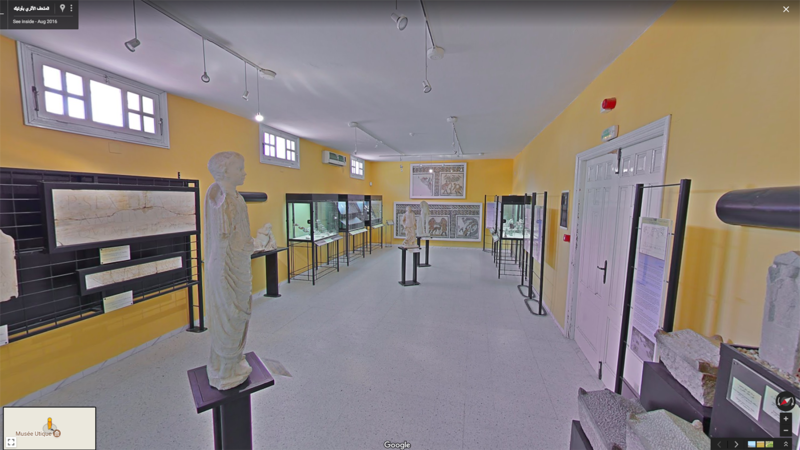 Explore the magnitude of Carthage during the Punic and Roman eras in the National Museum of Carthage. We hope that we've inspired you to take a moment to step into the wonder that is Tunisia. 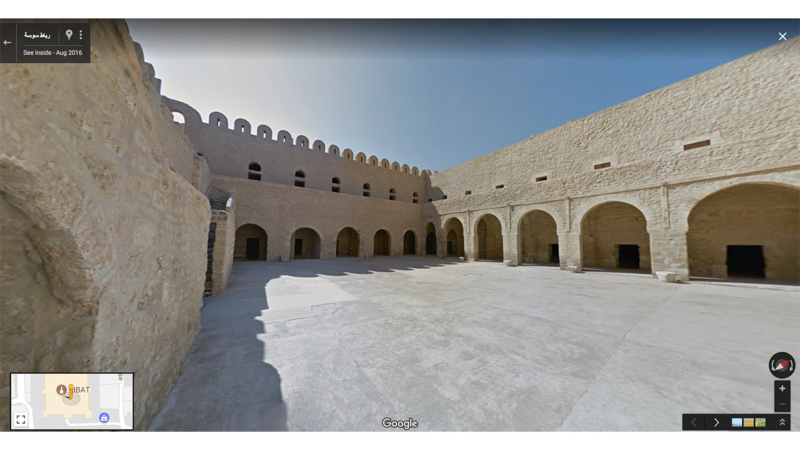 For more highlights from Tunisia Street View collection, visit Tunisia Highlights. This entry was posted in Google Travel Blog and tagged Google Travel, Maps, travel on July 24, 2017 by Chaza Nasser Merchak. 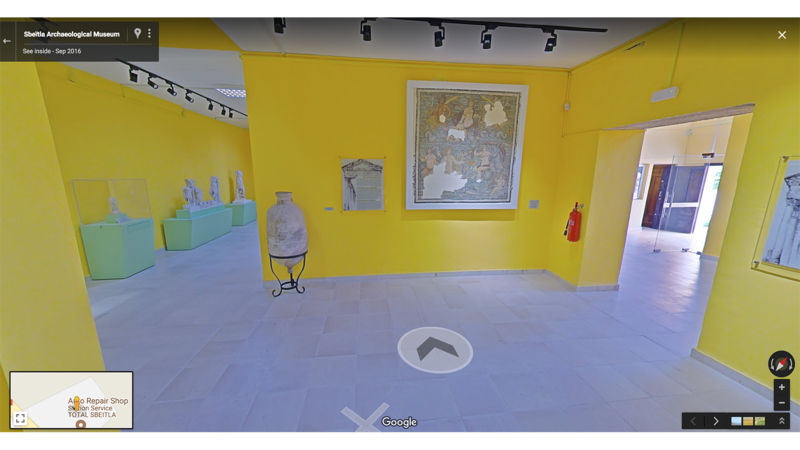 Explore the magnitude of Carthage during the Punic and Roman eras in theNational Museum of Carthage.